Byron May began his art career over a decade ago with his first solo show at The Gallery of Fine Arts in Louisiana. 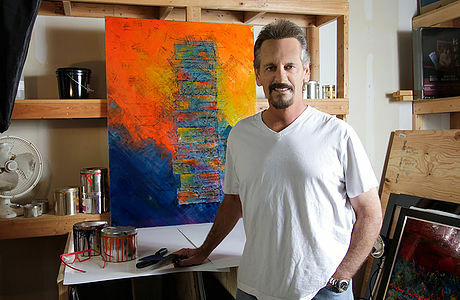 Since then he has had successful shows at The Brunner Galleries of Louisiana, multiple shows at Art on 5th in Austin, Texas, Planet Hollywood’s, “Oh My Goodard” Gallery in Las Vegas, Nevada, the Museum of Arts in Arlington, Texas, Rostad-Edwards Gallery in Miami Florida as well as numerous in home shows in Dallas, Texas. Byron was commissioned in 2015 by Tier-Reit Asset Management Group to create fifteen major works of art for their two high-rise office buildings, One and Two Briar Lake Plazas in Houston, Texas. Beginning in Fall of 2016, Byron will be represented by Mission Art Gallery in San Francisco California. Byron’s art career is most certainly on the rise. Byron’s art is a culmination of over 30 years in the graphic arts field. Bold colors, shapes and design have transcended from paper to his current canvas, stainless steel. Using a paint that he’s been developing for the past decade Byron He enjoys taking the mixture of elements that are un-assembled in his mind and creating art that excites and fascinates him. If he does not accomplish this with a painting it will not be sold. Every time you view a piece of his work you will see something different that captivates and moves you. Over the past decade Byron has developed a proprietary soy based paint that enables him to create amazing effects on stainless steel. This brilliant paint, coupled with ever changing light reflections from the steel and Byron’s artistic talents make his paintings demand your attention. Copyright © 2016 ByronMayArt.com. Website design by May Marketing Group.